There is an enclosed car park for 11 cars in our courtyard. Spaces are only available when booked in advance. Price: 20 € per vehicle per day. 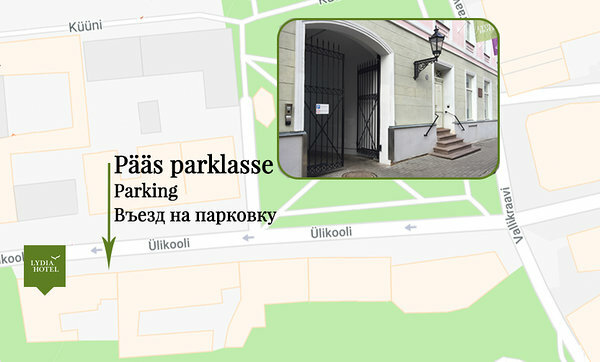 Parking are accessible for cars with a maximum width of 2.4 m and a height of 2 m.
The area around the hotel falls within Tartu city center's parking zone A and therefore parking fees apply when parking near the hotel. Parking fees apply from 8:00 to 18:00 on weekdays (Monday to Friday). Parking is free on weekends (Saturday to Sunday) and public holidays. Price: 2 € per hour or 10 € per day.